Though they trace their history to the most ancient Christian communities on earth, they have long been minorities in an unstable, intolerant region, where they’re often identified with “the West.” . . .
. . . According to the Pew Research Center, Christians are the world’s most persecuted religious group. Their faith makes them targets of violence. Their commitment to the cross of Christ — to power-in-weakness, to nonviolence, and to peace — makes them uniquely vulnerable. 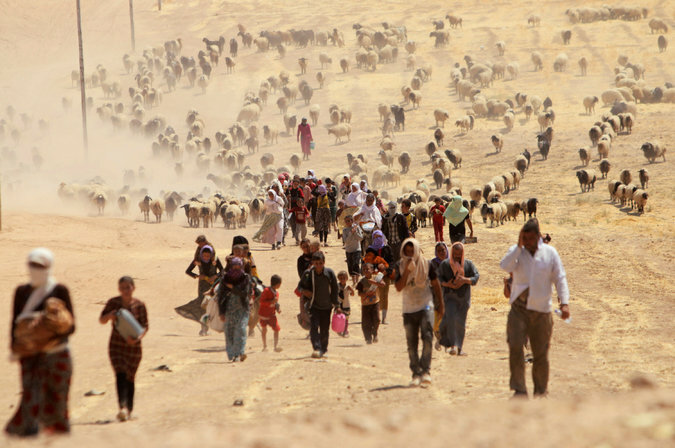 Yazidis fleeing Sinjar, Iraq in 2014 after ISIS took the town. First, pray fervently. God hears the prayers of the righteous (James 5:16), and He is near to the brokenhearted (Ps. 34:18). How much more, then, will God hear the prayers of Christians interceding for those who are suffering. Pray for the protection of our brothers and sisters in the Middle East, and for peace and perseverance. Pray for an end to violence, for restoration to homes and communities, and for reconciliation with neighbors. . . .
Second, give generously. A number of U.S.-based nonprofits work directly with persecuted minorities in the Middle East. Make an immediate impact by giving generously to Catholic Relief Services, the Knights of Columbus Christian Refugee Relief Fund, and Open Doors USA. . . . Finally, be a light. Many Americans and many Christians are in the dark about what’s happening in Iraq and Syria today. We can be a light right here at home by raising awareness within our communities — our social networks, our churches, and our political circles. Speak up. Encourage your church to pray more fervently. Encourage your friends to give more generously. Encourage others to be a light in their own communities. It could mean the difference between life and death for our persecuted brothers and sisters. For Christians, remembering is not simply an act of mental cognition. It is a way of doing justice. We remember those who are suffering through our prayers, our financial support, and our activism. And in doing these things, we are not simply rendering aid – we’re offering hope. We are reminding persecuted Christians that we see their suffering, and that God does, too. Read the full essay here. Check out my prior post on Genocide Against Christians (And How the Church Can Help).